SWAT competes successfully with members producing great results in both local and national competitions. There are now over 50 dogs on the membership list - some doing agility for fun and fitness but with a large majority who do compete. SWAT has become the most successful south west based agility club in the national league tables, having reached The Agility Club's Premiers Division. This has been achieved by consistent teaching, having fun, recognising the specific needs of individual partnerships and planning their training accordingly - no two partnerships are the same and this has to be a huge consideration in methods and systems taught. SWAT do not advocate the use of harsh training methods/handling. SWAT firmly believes that your dog is your pet and friend, first and foremost, if it competes at agility then that's a bonus. We do not tolerate dog owners who rehome dogs purely based upon the animals ability to succeed in agility. 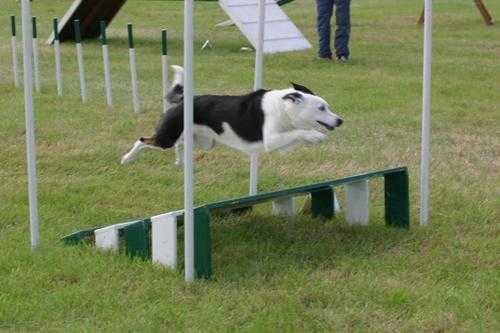 Agility is a hobby. SWAT was founded, and is run by me, Toni Davis. I organise and oversee all the training helped by Lizzie Elliott. Between us we do all the training ensuring consistency is maintained throughout the club. You can be assured that you are ALWAYS trained by someone competing at the top level of UK agility and with the highest qualifications - something that is unique to SWAT in the South West. Toni has been competing in agility since 2001, where she took her first dog to Senior Grade and is an Agility Club Appointed Instructor First Class - the highest qualification available to a UK trainer. She is also a qualified Kennel Club Judge. She currently competes with 3 dogs, one at Kennel Club grade 7, one at Kennel Club grade 6 and her youngster at Grade 3. Toni firmly believe that handlers who train with SWAT, learn of the club directly from our success as a club and the support and commitment given to each club member. Toni does training days for other clubs and people travel from all over the country to book lessons with her. Her success lies in being able to bring out the best in every dog / handler partnership - happiness and consistency are the main keys. Lizzie competes at Grade 7 and Champ with Banjo, a working Cocker. 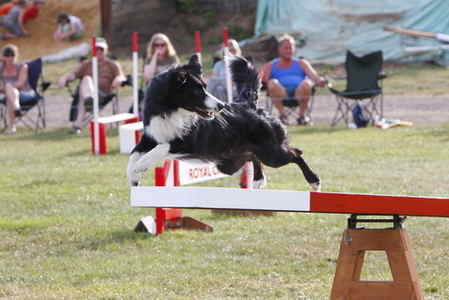 Banjo is her first agility dog and he has achieved phenomenal success in the national leagues, reaching numerous finals. Lizzie is a natural trainer and has learnt so much at SWAT helping with all levels of training - aided by her amazing cakes!! She currently teaches 121 Agility lessons and some Agility workshops. Sue's first dog, Alfie, was a rescue collie. 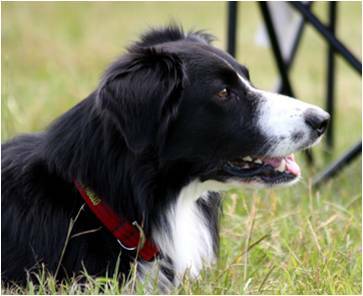 Alfie was responsible for Sue starting Agility in 2004 and reached UKA Champ level. Sue's current pack consists of collies, Tyme (who reached Grade 6 before retiring), Bingley who competes at Grade 4 and Cinders who competes at Grade 3. And then there is her youngster, Ember (a Mini American Shepherd) who is busy learning. Sue has always had a keen interest in CPD and learning. She has attended various courses for Rally and Scentwork and has considerable experience Trick training. Sue is a qualified Hoopers CHUK instructor. Sue takes our Rally and Obedience for Young Dogs classes. SWAT is sponsored by the SMART Clinic, who provide a complete rehab and fitness service for our canine friends. As the SMART clinic is run by vets they can offer so much more than massage and osteopaths, including acupuncture, ultrasound, physiotherapy and hydrotherapy, for a vast array of animals. They are the leaders in the field and have 2 state of the art bases in Wales. Insurance companies will usually pay for treatment at the SMART clinic. SWAT currently has a variety of breeds of dogs in training, including Spaniels, Schnauzers, Terriers and of course Border Collies.